The 2018 BCS Lecture is FREE to view on demand (press play below). BCS Members and conference attendees can access the full archive of 2018 conference webcasts for FREE by logging into the BCS main website. Visit the BCS Flickr photostream to view photographs taken at last years conference. The British Cardiovascular Society Annual Conference 2018 (code: 111009) has been approved by the Federation of the Royal Colleges of Physicians of the United Kingdom for 18 category 1 (external) CPD credit(s). Full conditions of approval are listed in the guidelines. The British Society of Echocardiography award 3 BSE re-accreditation credits (CME) per day of attendance at the Conference. 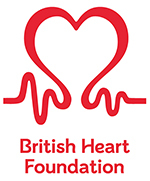 The British Heart Foundation, key supporter of the 2019 BCS Annual Conference.